At our community garden only a couple of weeks ago the gardens looked mature, green and bountiful. Now the gardens have been partly harvested and cleaned, plants are turning brown and the soil, which was mostly obscured by greenery is once again becoming a prominent feature. Our neighbour at “the farm” has installed a big plush bear with a winter scarf on their lawn chair. 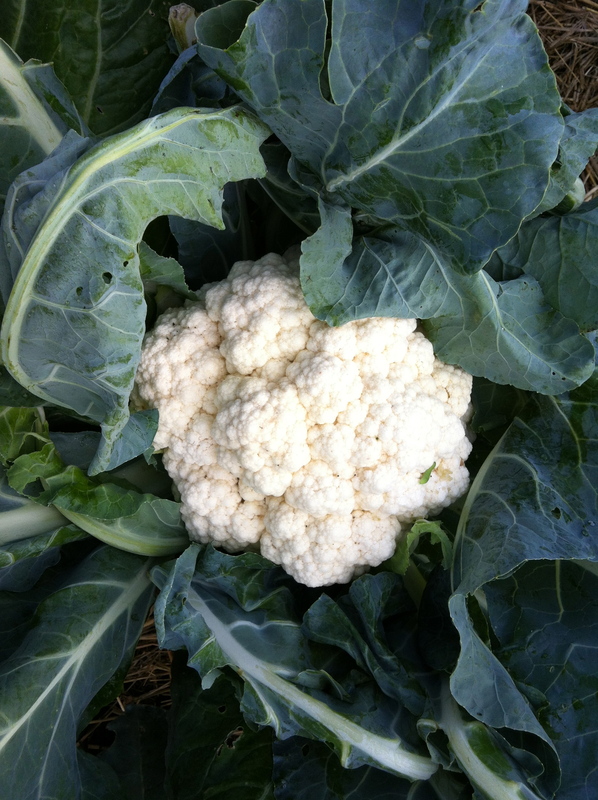 We are still harvesting cauliflower and broccoli. This head of cauliflower was 4 lbs 10 oz. Swiss chard grows all season and well, we can only eat so much swiss chard. There’s a very friendly woman who walks past the gardens often. She likes swiss chard and I asked her if she’d like some of ours. Thankfully, yes, she did and it’s been harvested nicely. It’s a shame to have Mother Nature and our efforts go for naught. We need to learn more about caring for tomatoes. We put cages around our plants but some plants were so laden with tomatoes the cages we no match for the weight. Any suggestions on what we should do differently? Different staking system or perhaps we should shape and prune the plants as they grow. In the end, though. we are enjoying a wonderful yield. year three we plant zucchini, we protect them and they make it to maturity but the yield is not amazing-perhaps a dozen in total. I swear mankind learned about camouflage from growing zucchini. There were no zucchini when I looked one day and the next day I found a 4 pound baseball bat size monster that had hidden under leaves for a long time. In later August mildew and squash beetles descend and have their way. year one (before we invested in vast amounts of horse sh$#, er, I mean mushroom compost, we planted butternut squash. We watched our neighbours plants bear all sorts of butternut squash (they had invested in soil amendments) and we had one or two smallish squash at the end of the season. year two the butternut squash plants are very happy. We decide not to plant too many and think we should try some winter squash too. What? 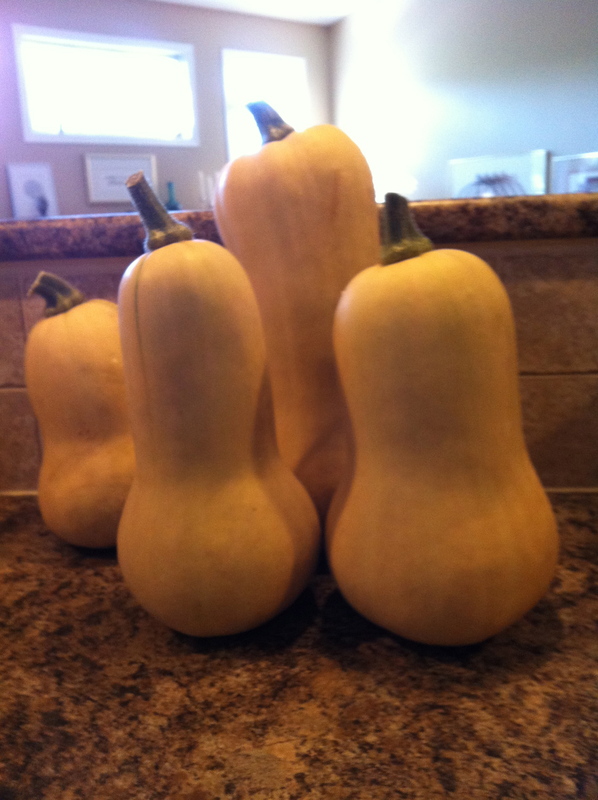 The plants we think are winter squash turn out to be butternut. Since we started them from scratch, we can’t put the onus on a market garden for mis-labelling. Somewhere things got mixed up. Butternut galore last year and then mildew and squash beetles attack but the squash make it to maturity. Bumper crop. year three-repeat of year two. Let’s not plant so many butternut-they spread too far and take up too much room. I take on starting the butternut and the winter squash. Given previous experience we should know what we are doing this year. And guess what, the plants I had thought were winter squash ended up being butternut. And once again, but later in the season than the previous two years, mildew and squash beetles descend. The yield is great. Some of the squash are well over 5 lbs, well over. And so there will be roasted squash and squash in soup and squash in muffins and so on. Do you have any butternut squash recipes to share? Perhaps I should be asking for recipes for winter squash too. In the hopes that next year we grow some. Cauliflower is awesome as are the tomatoes and squash . I love swiss chard but we did not have a garden this year (next year). Swiss chard steamed and served with vinegar and pepper. Yummmm!! I wish swiss chard was transportable then. I’d pack some up for you. You almost make we wish I had had a garden this year. 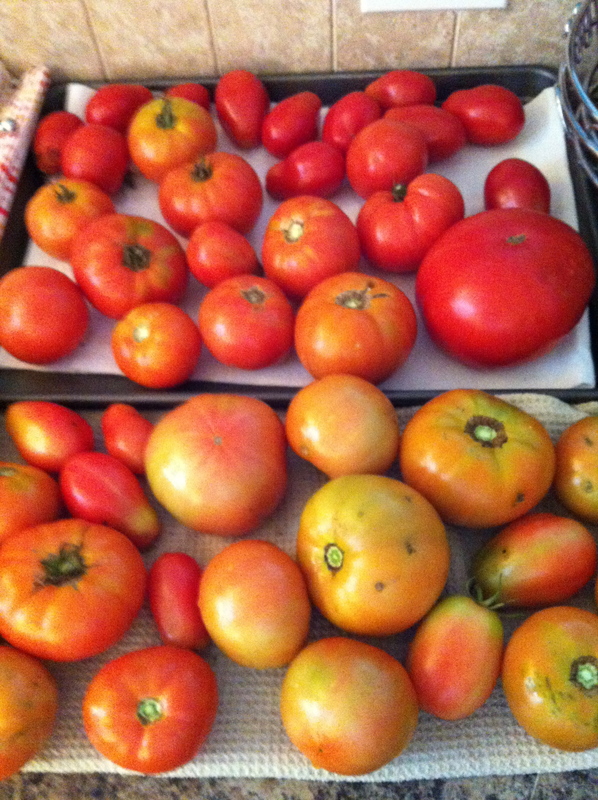 Tomatoes from the garden are the best. They are the best, field tomatoes. I love the smell of the plants, just as much as the smell of a carrot freshly plucked from the earth. So different from things all cleaned up and readied at the grocers. Nice to hear from you Penny.